Of all the things to worry about regarding your motor vehicle, the battery is one of the last things you want to have go out. Aside from the fact that it is often fairly inconvenient to replace them, it is also fairly expensive to do so as well. That is why manufacturers have developed different types of products designed to charge and maintain your batteries. With a battery charger, you do not have to worry about changing out your vehicle’s battery every time it begins to run low. Even better, if your battery dies and leaves you stranded, many of the best car battery chargers provide a jumper function. Of course, the type of vehicle you drive and how often you intend to use your battery charger are also important. Still, figuring out which battery charger is the best car battery charger for you can be a difficult and confusing task. That is why we have put together a list of the 5 best car battery chargers, highlighting what each one does best. Then we provide a helpful buyer’s guide so you can find the best car battery charger to suit your needs. CTEK is another brand on our list that has actually earned a near sterling reputation in the world of battery chargers. That said, this specific brand even has some other inherent built-in benefits in that not only does this brand focuses in power transferal products, it actually specializes in battery charges as well. In fact, it is worth noting that the CTEK car battery charger is a slightly modified version of OEM car battery chargers that are included with the purchase of high-end luxury cars. That said, this is a bit more narrow than some of the other car battery chargers on our list. When it comes to car battery chargers, too many people pay far more attention to the numbers on the charger than how the charger provides energy. This usually is not much of an issue, but it can actually make a big difference depending on the battery. Some batteries are more sensitive than others and require the energy itself to be of a “higher quality” or else it could damage the battery cells. As a workaround, the CTEK MULTI US 7002 makes it a point to provide the cleanest energy possible, so you do not have to worry about whether or not the energy charging the battery. While the CTEK MULTI US 7002 provides some of the cleanest energy out of all the car battery chargers on our list, it also has a number of failsafes to ensure that even if the energy itself is clean, no other malfunctions can damage your car battery. For instance, this car battery charger comes with reverse polarity protection which actually protect both the car battery in question as well as the CTEK MULTI US 7002. In fact, this feature along with others, allows the CTEK MULTI US 7002 to be left in indefinitely which is perfect for DC battery-powered electronics arrays. Schumacher is a fairly well established company in the car battery charger market that has earned one of the better reputations. Part of the reason for this reputation comes from the fact that the company not only makes a solid product but they do so at different levels of the market. For instance, there is a fairly big difference between what someone who needs a car battery charger for their own personal car and someone who needs a car battery charger for larger vehicles, numerous different types of vehicles, or simply a large number of batteries for whatever person. This is where the Schumacher SE-4020-CA comes into play and is why it is rated as the best industrial car battery charger on our list. One thing that most people forget about when they consider industrial car battery chargers is the fact that there are a multitude of different types of batteries out there. While industrial car battery chargers may have been made to handle serious levels of amperes and voltages, they are also often designed to simply handle virtually every vehicular battery you might run across. That is why the Schumacher SE-4020-CA can actually charge batters that feature 2 different voltages and can do charging at an astounding 4 different amperages. This means that regardless the battery output or its input limitations, the Schumacher SE-4020-CA should be able to charge nearly any and every large voltage battery that you come across. While the sheer number of options with the Schumacher SE-4020-CA is impressive, just as impressive with this car battery charger is its build quality. Many of the other car battery chargers we reviewed have opted for a smaller, more portable profile to make them more attractive to the average consumer. Of course, someone who needs an industrial car battery charger is likely not the average consumer. That is why the size and weight of this car battery charger is actually a benefit to its intended market as opposed to inconvenient to the average consumer. On top of that, this car battery charger also has a built-in, included dolly to make moving the Schumacher SE-4020-CA from one place to another much easier. NOCO may not be the most well known brand on our list, but it does offer some legitimate benefits that you just will not find on every product. Even better, this is a brand that at least specializes in battery chargers and their accessories. That said, the quality of this brand should not surprise anyone since they have been in existence creating similar products along this technology track for over a century. Still, the NOCO ends up making our list for their car battery charger that is best used in the water. While there are specifically marine battery chargers out there, they are often significantly more expensive than car battery chargers due to the smaller, niche market. If you would like to save some cash while still getting a stellar product, NOCO Genius G7200 was designed to serve double duty as both a land and sea battery charger and even makes it a point to advertise this. The reason that the NOCO Genius G7200 is so well-suited to this task is because it features an IP65 rating. What this means is that the NOCO Genius G7200 can withstand jets of water splashed on it. While this is not a submersion level of protection, it should be plenty for most water activities. Another benefit of the NOCO Genius G7200 is the fact they make one for pretty much every battery used for commercial vehicle. While you may not be able to recharge an industrial vehicle with the NOCO Genius G7200, there are 2 different voltages and 7 different amperages to choose from–though you will need to purchase a separate car battery charger for each rating. Beyond the electrical states it can handle, the NOCO Genius G7200 is also compatible with numerous charging systems that extend well beyond simply the vehicular setting. It also does not hurt that the compact design of this car battery charger makes it easy to take on the go. When it comes to car battery chargers, BLACK+DECKER is likely not the first name that you think of. Though the brand has a bit of a mixed reputation, it is still one of the most popular brands available – usually in part due to their ability to provide products at a significantly lower cost than most of their competitors, though that does not necessarily apply to this situation. To make matters trickier, BLACK+DECKER does not specialize in either car battery chargers or power management products. Arguably the best reason to choose the BLACK+DECKER BC25BD is the fact that over the course of time and through repeated uses, it can actually improve the efficiency and lifespan of you battery. Basically, the BLACK+DECKER BC25BD can alter how it distributes the power to your battery such that the cells which were otherwise depleted will shake off some of the contaminants and be usable once again. That said, this will not take a completely depleted battery and restore it life once again, but it will still be able to help usable batteries keep their life a little bit longer than they otherwise would have and is not a feature found on even some of the more renowned products we reviewed. Considering that BLACK+DECKER is a brand that is designed for consumers and not professionals, it only makes sense that they would spend a bit more time providing a number of features that can make their product stand out from the pack – even if those features do not actually improve the product at a fundamental level. That said, these features are legitimately useful for consumers who might not want to fool with the issues. For instance, the BLACK+DECKER BC25BD comes with both a jump start feature to jump start your vehicle when the battery is dead and an alternator checking feature to make sure that the battery is the problem in the first place. When it comes to power management, there are few companies that saw which are able to compete with the sheer gravitas of Schumacher. That said, it should be noted that Schumacher does not actually specialize in car battery chargers, though they do specialize in different power management products like power converters and testing products. Still, Schumacher is definitely a cut above most and is able to not only provide some of the best car battery chargers but do so at significantly lower costs than many of their competitors. Even though the Schumacher SEM-1562A-CA is by far the least expensive product that we reviewed, it actually offers some legitimately impressive control features. That said, it is not the control settings that are impressive but the mechanism which allows them. Specifically, the Schumacher SEM-1562A-CA comes with a microprocessor that can keep track of the different energy readings within the battery to make sure that the car battery charger does not supply electricity with readings that could potentially damage the battery. Thankfully, the microprocessor also has the advantage of allowing the Schumacher SEM-1562A-CA to charge at different levels. This microprocessor in the Schumacher SEM-1562A-CA actually does more than simply track the energy readings–it also has one of the more rare types of protection that we saw. Basically, this car battery charger is able to withstand higher temperatures than most of the others on our list–which is a big deal as that is arguably the most common type danger facing a car battery charger. On top of that, the microprocessor is also able to make sure that the Schumacher SEM-1562A-CA does not run the risk of overcharging the battery, so you can leave connected the whole time. The microprocessor essentially gives the Schumacher SEM-1562A-CA car battery charger the ability to have multiple charge settings. While all of the products that we reviewed are ostensibly car battery chargers, some of them may actually be a bit more specialized in its function and, though it can certainly charge a car battery, is actually intended to be used for other tasks. Quite often, this has more to do with how the car battery charger interacts with the battery when it is at different levels of being charged. The important thing to remember is that not all types of battery chargers are intended to charge a battery that is completely drained. Similarly, some battery chargers are meant to be used on older batteries that might otherwise be on their last leg. Maintainer – This is the “middle ground” when it comes to the different types of battery chargers. It will not recharge a completely drained battery like a standard battery charger will, nor will it focus on heavily at restoring the batteries cells to their former state. Instead, this type of battery charger is meant to keep a battery that still has some juice left in it from completely running out as well a providing some cell maintenance while it does. Keep in mind, this type of battery charger cannot usually handle some of the more extreme types of battery issues. On top of that, individual models are often limited in the type of batteries they can charge. Charger – This is the standard type of battery charger and the one that most people should look for unless you have a fairly particular circumstance. This type of charger comes in the most varied permutations including the most different types of batteries, the most voltages, and the most amperages. 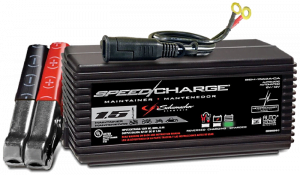 Ultimately, if you have any kind of car battery, then there is a standard charger out there that can handle it. One of the great things about a standard car battery charger is that they are designed to be able to charge a battery that has been completely changed. On top of that, standard car battery chargers are often less expensive than some of their counterparts and they are also made for a wider range of vehicles than some of the other types of car battery chargers. Restorer – This is the least common type of battery charger and, in truth, the charging function is simply a necessity of this product’s actual function. Essentially, a restorer is able to break down the various contaminant build ups in the battery’s cells so that they can once again consistently hold an electric charge. This is usually accomplished through various manipulations of the charging energy which then either realigns the cell’s constituents or breaks down the byproducts. This is generally the most expensive type of car battery charger and is truly only necessary if you have a large number of vehicles and batteries that will regularly need to be restored and charged. If you do not own a fleet of vehicles or have other uses for that many batteries, then this is not a worthwhile purchase. The different voltages that a car battery charger can put out will have a big impact on whether or not it is appropriate to use with your vehicle. For instance, car battery chargers are used to charge the batteries for more than just cars. Trucks and even marine crafts all use car battery chargers–though many of them may actually use a battery that is not the standard 12V that a car will generally use. Thankfully, there are plenty of car battery chargers on the market that provide a wide range of different battery voltages that it can distribute. In fact, there are plenty of battery chargers can can charge voltages as low as 6V and as high as 48V. This means that car battery chargers can conceivable service vehicles ranging from as big as industrial vehicles to smaller vehicles like go-karts or other smaller vehicles. Much like with voltages, there are a wide range of amperages that different batteries required. That said, much like the wide range of voltages that a car battery charger can provide, so too do many car battery chargers have the option of distributing the electricity with different amperages. Sometimes the car battery charger will be able to differentiate this on its own, whereas other times you might need to know what amperage the battery requires and set the car battery charger to that amperage. It is worth noting that the different amperages will also affect how quickly the car battery charger will charge the battery. That said, you must still be careful, because there are plenty of batteries out there with a maximum amperage rating at which point it can be dangerous to charge the battery beyond. In this instance, you can risk damaging the battery or the charger, and it is not at all unheard of that the car battery charger even begins to smoke when pushing too high of amperages. This is a feature that can greatly improve the car battery charger performance, but it is not, strictly speaking, necessary. Essentially, a car battery charger with different charge phases is able to first read the electrical signals from the battery and decode that information to determine what kind of state the battery is in. The car battery charger will then adjust its charge setting to best accommodate the state of the battery so that it responds to any potential issues. The most common type of phase beyond simply charging that comes with car battery chargers that have multiple charging phases is the maintenance phase which, despite its name, does not always actually provides the battery with any restorative benefits. Instead, a maintenance charging stage identifies what the idle amperage of the battery is–the amount of energy the battery inherently releases when plugged up but not powering–and keeps providing that amount to top it off without ever overcharging it. Back in the day, if you wanted to charge a battery, there was a pretty good chance that the battery charger was nearly as large as the battery itself. This made it fairly difficult to keep a battery charger on hand with you. Thankfully, with today’s progression of technology, car battery chargers have been miniaturized to the point that they can often fit in the palm of your hand. However, this compact size actually presents more benefits than simple convenience. For instance, many situations where you may need to charge a car battery do not even involve vehicles. There are numerous circumstances where a car battery may power an unrelated electronics array. In this situation, you may want to keep a maintenance car battery charger connected to it at all time. With a smaller car battery charger, this is much easier to do and makes moving the arry easier as well. Unlike the batteries that they charge, car battery chargers are not always the most protected against intrusion by the outside elements. Considering the bulk of a car battery charger is simply wires and a circuit board as well as the power transformer which actually changes the AC input electricity into DC output electricity for the battery. As such, if a car battery charger is not properly protected, it can become damaged and fail when exposed to the elements. In this instance, your 2 biggest concerns are water and dust. Keep in mind, heat can also be a problem, but it is easily rectified by simply putting the car battery charger in a shaded area. For the water and dust, there is a IP rating system which determines how resistant to these contaminants the car battery charger is. This quality is far more important for a car battery charger that will used to charge a battery used for a non-vehicle array of electronics. As we can see, there is no product which will satisfy everyone as the best car battery charger due to the different types of chargers as well as the different needs of potential consumers. The charger that someone needs to charge large industrial vehicles is not at all the same kind of car battery charger someone would look for if they simply needed to recharge the battery in their own car. For the former, we recommend the Schumacher SE-3000 with its sheer range of options. With the various voltages and amperages, there is a good chance that even though this was designed to be used as an industrial car battery charger, it can actually charge much smaller batteries. On top of that, it is by far the most durable product we reviewed. Of course, for the average consumer, the Schumacher SE-3000 is simply more than they need and actually quite inconvenient for their purposes. In this case, we recommend the CTEK MULTI US 7002 which though it has a narrow range of use is ideal for most consumer purposes. The various options and precautions make this a great car battery charger for you everyday vehicle.